As normal on the Easter meet the arrival times on Friday were generally earlier than usual as several of us who had enjoyed the first day of a long weekend had stopped off for a walk (or run in some cases) on the way to Corran. 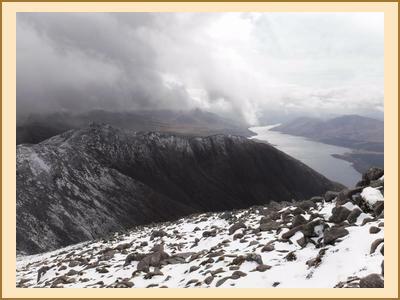 Alan and Antti did Carn na Caim and a'Buidheanach Beag in horizontal snow, Claire experienced hail at the back of Ben Wyvis for a couple of munro tops, Alison C did Geal Charn and Creag Pitridh, Kenny did Creag Pitridh and Alison F did 3 corbetts at Tyndrum. Fiona and Mike had made an even earlier start to the weekend and headed up on the Thursday night so as to get to Loch Arkaig for an early start on some hills there on Friday. Saturday brought a reasonably bright start with a smattering of snow on the hilltops. Alan, Claire and Fiona M were first off with bikes and walking gear for what turned out to be an ‘epic’ cycle along Loch Etive followed by a hike up Beinn nan Aighenan. From there Claire went on to Ben Starav and its two tops whilst Fiona and Alan did the two Starav tops and a Graham - Ben nan Lus before regrouping to embark on the long cycle back (with Fiona regretting her choice of winter boot footwear). Meanwhile Chris A took his car across the water to Ardnamurchan for a long linear walk over several Grahams and Corbetts, Philip was unimpressed with the weather on Phillip was on Rois Bheinn and Daniel had a good day on Beinn a Bheithir. Fiona and Mike did Bidean nam Bian, Alison C did Binean Beag and Kenny completed his first triathlon of the weekend with a boat from Fort William, a walk over a Hugh (Hills Under Graham Height), a cycle down to the Corran Ferry and a boat back to the hostel. The remainder of the party were in Corbett bagging mode - Gillian, Margaret, Chris R and Kate did 2 Corbetts near Loch Shiel (Beinn Odhar Bheag & Beinn Mhic Cedidh) and Alison F, Fiona C, Antti and Cathy are still searching for the alleged ‘3km of effortless walking’ on the ridge of Braigh nan Uamhachan. After a mixed morning weatherwise the day improved somewhat and the group enjoyed drinks outside in the sun on the return to the hostel on Saturday afternoon /evening. Sunday brought a wet start and a longer lie for many. A large party headed for the climbing wall in Fort Bill. Others waited for the rain to abate a bit before setting off on their adventures. A few outings on the ferry - Cathy and Kate headed across the water for Sgurr Dhomhnuill, Alan R for Sgurr na h Eanchainne and Kenny for his second triathlon of the weekend involving a Marilyn, Beinn Leamhain. Meanwhile, Chris R and Sam did Mullach nan Coirean and Stob Ban from Glen Nevis, Gillian, Margaret & Fiona C did a Graham near Loch Arkaig and Philip got very wet up Glen Etive. The evening involved a group outing to the Inn at Ardgour for dinner. Monday was the best day of the weekend – sunny with very little wind. Alison C, Fiona M, Fiona R and Mike went climbing in Glen Nevis, Kenny did Aonach Mor and Aonach Beag. 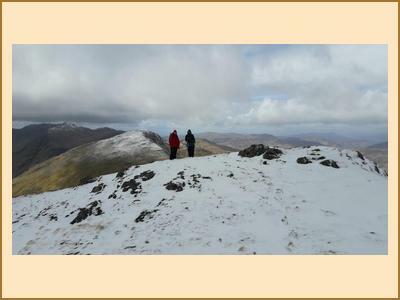 Antti, Sam and Chris were on Beinn a Bheithir, going up via schoolhouse ridge. Gillian and Margaret went across on the ferry to do Sgurr na h Eanchainne. Kate did Creach Bheinn and Beinn Sgulaird and enjoyed fantastic views of the islands in the sunshine. Alan R and Claire headed for a run up two Grahams and a Corbett on Ardnamurchan – all good until Alan R bashed his shin on the final descent after which the run became more of a hobble. Hope all recovered Alan. Chris A did Streap.